Hire a dedicated development team or individual developer to help you with your projects. Scale your team up or down any time, and reach you market faster. We help startups and enterprises in need of software development resources to save time and money by providing them with carefully vetted and well-trained developers, QA testers and project managers. Hire a complete team, or expand your existing team with top-notch developers to help with your current and future development projects. If you don’t need an entire team, you can also hire a single developer for full-time or even part-time work. Skip the expensive and time-consuming recruitment and training process, and start working with dedicated professionals who are ready to get to work immediately. Our developers have already proven themselves capable of meeting all client requirements, and successfully completing highly complex software projects. 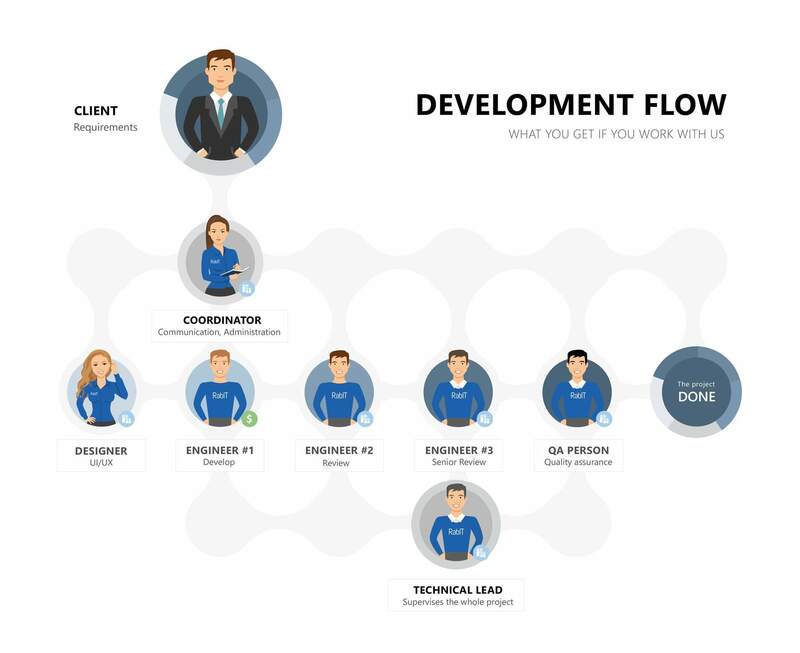 Our development flow and team setup is designed to allow for complete customization and continuous optimization. You can really personalize the way you want to work with us. You can choose how many engineers you want to work with, what technology stack you require, weekly work hours, frequency and channel of communication, and more. Everything is engineered to meet your specific needs. We also have our own unique, built-in process for QA testing. Every code we write goes through three rounds of review, resulting in exceptional quality.